Ronnie Walter Cunningham (born March 16, 1932), (Col, USMCR, Ret.) is a retired American astronaut. In 1968, he was a Lunar Module Pilot on the Apollo 7 mission. He was NASA's third civilian astronaut (after Neil Armstrong and Elliot See), and has also been a fighter pilot, physicist, entrepreneur, venture capitalist, and author of The All-American Boys. Cunningham was born in Creston, Iowa on March 16, 1932. He graduated from Venice High School in Venice, California. After high school, Cunningham joined the U.S. Navy in 1951, and began flight training in 1952. He served on active duty as a fighter pilot with the U.S. Marine Corps from 1953 until 1956, flying 54 missions as a night fighter pilot in Korea. Armistice discussions were still on-going when Cunningham initially left for Korea, and the Korean Armistice Agreement was signed just before he arrived. From 1956 to 1975, he served in the Marine Corps Reserve, ultimately retiring at the rank of Colonel. Cunningham received his B.A. with honors in 1960, and his M.A. with distinction in 1961, both in physics, from the University of California, Los Angeles. He completed all requirements save for the dissertation for a Ph.D. in physics at UCLA during his time at RAND Corporation, where he spent three years prior his NASA selection. In October 1963, Cunningham was one of the third group of astronauts selected by NASA. On October 11, 1968, he occupied the Lunar Module Pilot seat for the eleven-day flight of Apollo 7, the first launch of a manned Apollo mission. The flight carried no Lunar Module and Cunningham was responsible for all spacecraft systems except launch and navigation. The crew kept busy with myriad system tests and successfully completed test firing of the service-module-engine ignition and measuring the accuracy of the spacecraft systems. Schirra, with a cold, ran afoul of NASA management during the flight, but Cunningham went on to head up the Skylab Branch of the Astronaut Office and left NASA in 1971. He has accumulated more than 4,500 hours of flying time, including more than 3,400 in jet aircraft and 263 hours in space. In 1974, Cunningham attended Harvard Business School's six-week Advanced Management Program and later worked as a businessman and investor in a number of private ventures. In 1977, he published The All-American Boys, a reminiscence of his astronaut days. He was also a major contributor and foreword-writer for the 2007 space history book In the Shadow of the Moon. In 2018, Cunningham joined the Back to Space organization as an Astronaut Consultant with the goal of inspiring the next generation to go to Mars. In 2008, NASA awarded Cunningham the NASA Distinguished Service Medal for his Apollo 7 mission. He is currently a radio talk show host and public speaker. Cunningham also works as a consultant to start-up technology companies and is chairman of the Texas Aerospace Commission. In an editorial published in the Houston Chronicle on August 15, 2010, Cunningham argued that the empirical evidence does not support the claims of global warming. The editorial, titled "Climate change alarmists ignore scientific methods", stated his opinion that the global warming debate hinged on four key points. "About 20 years ago," he stated, "a small group of scientists became concerned that temperatures around the Earth were unreasonably high and a threat to humanity. In their infinite wisdom, they decided: 1) that CO2 (carbon dioxide) levels were abnormally high, 2) that higher levels of CO2 were bad for humanity, 3) that warmer temperatures would be worse for the world, and 4) that we are capable of overriding natural forces to control the Earth's temperature. Not one of these presumptions (opinions) has proven to be valid." Cunningham is a member of numerous organizations. He is an associate fellow of the American Institute of Aeronautics and Astronautics, fellow of the American Astronautical Society, member of the Society of Experimental Test Pilots, American Geophysical Union, Explorers Club, Sigma Pi Sigma and Sigma Xi, Association of Space Explorers, Houston American Revolution Bicentennial Commission, Aviation Subcommittee, Houston Chamber of Commerce, Earth Awareness Foundation, National Association of Small Business Investment Companies. International Air & Space Hall of Fame, San Diego Air and Space Museum, inducted in 2011. ^ a b c d e f g h i j k l m n o p q r s t u v "Walter Cunningham". NASA JSC. July 2014. Retrieved December 14, 2016. 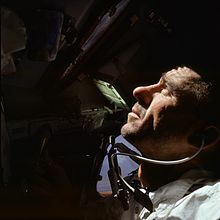 ^ "Lunar Module pilot on Apollo 7, the first launch of a manned Apollo mission". New Mexico Museum of Space History. Retrieved December 16, 2016. ^ Wade, Mark. "Apollo 7". Encyclopedia Astronautica. Archived from the original on October 12, 2008. Retrieved December 16, 2016. ^ Cunningham, Walter; Herskowitz, Mickey (1977). The All-American Boys. New York: Macmillan Co.
^ "In the Shadow of the Moon". University of Nebraska Press. Retrieved December 16, 2016. ^ "First Apollo flight crew last to be honored". collectSPACE. Retrieved 2008-10-20. ^ Cunningham, Walter (2010). Global Warming: Facts versus Faith: One Astronaut's Views (PDF). Chicago, Illinois: The Heartland Institute. p. 2. ISBN 978-1-934791-30-1. Retrieved April 3, 2012. ^ Cunningham, Walter (August 15, 2010). "Climate change alarmists ignore scientific methods". Houston Chronicle. Retrieved April 3, 2012. ^ "Walter Cunningham's memberships". Walter Cunningham. Retrieved December 14, 2016. Cunningham, Walter (1977). The All-American Boys. MacMillan Publishing Company. ISBN 0-02-529240-4. French, Francis and Colin Burgess (2007). In the Shadow of the Moon: A Challenging Journey to Tranquility. University of Nebraska Press. ISBN 978-0-8032-1128-5. Wikimedia Commons has media related to Walter Cunningham.